Neoregelia (pictured right) are an easy care bromeliad species that are suitable as either an indoor or outdoor plant depending on climate. Neoregelias such as N. compacta, N. spectabilis and N. lilliputiana are fairly easy to care for and characterized by broad brightly colored, slightly curved leaves and a shallow water collecting depression in the centre of the plant. 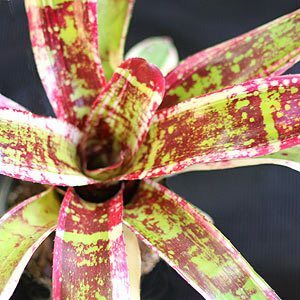 Neoregelia Red ‘Blast’ is a red centered brom with darker green foliage surrounding, a real eye catching plant. Neoregelia are a Bromeliads and with over 120 species and 1000s of cultivars available they are capable of providing a wide range of both variety and colour to the garden. They also work well in pots or containers and can be grown indoors. 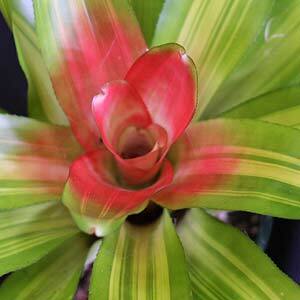 These are a tough bromeliad and will cope with colder (and hotter) conditions than many others. Neoregelias are grown mainly for the foliage which has attractive color and markings. They are a tank type bromeliad and hold water in the foliage. In terms of care, protection from hot direct sun is important to stop the foliage from being burnt, many growers choose to grow Neoregelias beneath shade cloth for this reason. Little fertilizer is required although some growers do use a diluted liquid seaweed fertilizer every 6 months, usually spring and autumn. Over fertilization will cause excess leaf growth and lack of colour. Watering during dry spells is required, if the ‘tanks’ are filled every week the plants should be fine. A few standouts in this group of plants with some cultivars with brightly contrasting green and red foliage such as Neoregalia Garnish. Lots of Neoregalia carolinae cultivars as well. Blue purple and red centred Neoregalia are all available with a few with strongly variegated foliage as well. It needs to remembered that colour will vary greatly depending on the exposure to sun and the actual cultivar. Other popular species include: Neoregelia carolinae, and N. ampullacae available for sale from specialist Mail Order Nurseries.